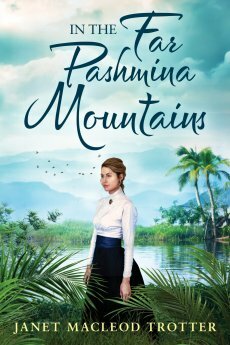 IN THE FAR PASHMINA MOUNTAINS - SHORTLISTED FOR THE RNA HISTORICAL ROMANCE NOVEL OF THE YEAR! The novel is published by Lake Union and is available as an ebook, paperback and audio. Janet writes: ‘The idea for this novel was inspired by my MacLeod ancestor, Lieutenant Donald MacLeod of the Honourable East India Company, who left his home on the Isle of Skye in the 1760s for a soldier’s life in India. My great-great-great-great-grandfather Donald died on a passage back to Britain, probably of some tropical illness or wounds, and never saw Skye again. Although the novel is set a generation later, my hero is from Skye and seeks his fortune in the East India Company army.